In the previous part, our secondary sort job (view) used the NaturalKeyPartitioner to assign map output pairs to reducers based on the natural key (“state” field) hashcode. This yields a correct fully sorted 3-file result. If we look at the beginning and end of each output file, we can see that each state belongs to only one reducer. And we can also see a continuation in the ordering of states across all output files. This is a successful Total Order Sorting. It was manually coded. If we want to use 4 reducers instead, we need to code a new partitioner. To overcome these problems, there is a powerful but complicated partitioner in Hadoop called the TotalOrderPartitioner. Basically, the TotalOrderOrderPartitioner does the same thing as our custom class, but dynamically and with correct load balancing between reducers. To do that, it samples the input data to pre-calculate how to “separate” the input data into equal parts before the Map phase starts. It then uses those “separations” as partitioning boundaries during the mapper’s partitioning phase. Let’s first create a more simple dataset to explain and test how the Total Order Partitioner works. RandomSampler : samples randomly based on a given frequency. This is the one we use in this example. IntervalSampler : takes samples at regular intervals (for example every 5 records). SplitSampler : take the first n samples from each split. The input sampler writes a “partition file” Sequence File in HDFS, which delimits the different partition boundaries based on the sorted samples. For n reducers there are n-1 boundaries written to this file. In this example there are 3 reducers, so 2 boundaries are created : “MD” and “PA”. 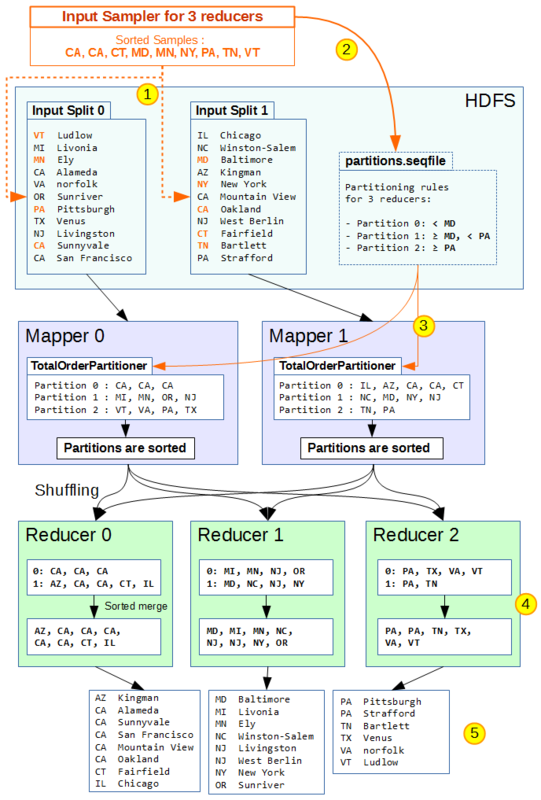 The MapReduce job begins with the mapper tasks. 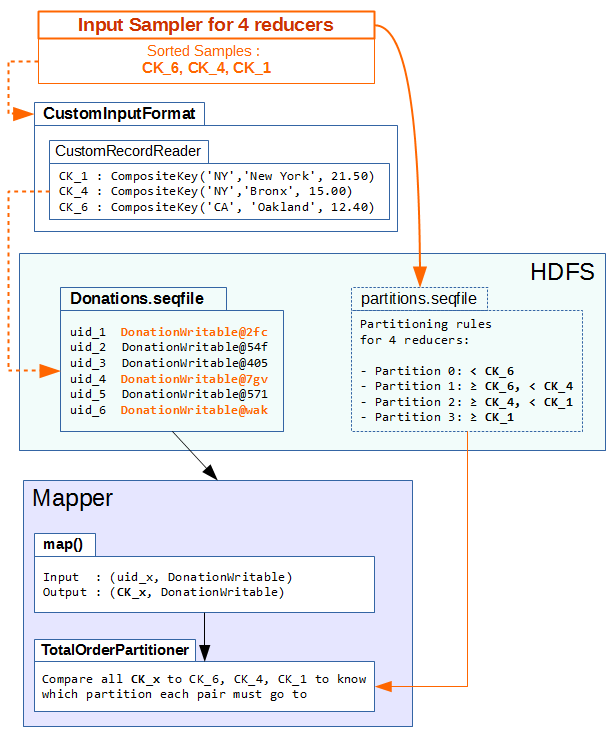 For partitioning, the mappers use the TotalOrderPartitioner, which will read the partition file from HDFS to obtain partition boundaries. Each map output is then stored in a partition based on these boundaries. After the shuffle, each reducer has fetched a sorted partition of (key,value) pairs from each mapper. At this point, all keys in reducer 2 are alphabetically greater than all keys in reducer 1, which are greater than all keys in reducer 0. Each reducer merges their sorted partitions (using a sorted merge-queue) and writes their output to HDFS. freq = 0.01 : The sampler will run through all records and each record will have a 0.01 (=1%) probability of being chosen as a sample. numSamples = 1000 : There will be a maximum of 1000 samples. If the maximum number of samples is reached, each new chosen record will replace an existing sample. maxSplitsSampled = 100 : Only 100 splits will be sampled. In our case there are only 2 splits so this maximum won’t be applied. The job’s input paths : as inputs for the sampling. The number of reduce tasks : to write the “partition file” sequence file containing partition boundaries. This time, when we execute the job, we have a log telling us how many samples will be taken. 2 things which look like US states ! Between some funny characters and unicode points we can identify “FL” and “NY”. By visualizing outputs, we can see that the second outputs starts with FL state ! And the third output starts with NY. The cities are not sorted, of course, because we have no control on how the values enter the reduce function, since we did not use Secondary Sort. But we succeeded in sorting by state across all reducers, and the output file are quite balanced in size, compared to our manual partitioning in the previous section. We can also change the number of reduce tasks in the job configuration from 3 to 4 or 10 without worrying about the partitioner. Why do we specify a V value class for the sampler ? It stored <Text, NullWritable> pairs in the partition file that we viewed, so apparently it doesn’t need to read values from the input. Probably because it was easier to implement, since everything is <K,V> parameterized in MapReduce. Especially for reading/writing Sequence Files. I’m not really sure. I believe that it would be better if the types were independent. This is somewhat linked to the next question. Why is it a map OUTPUT key class ? The InputSampler reads input splits, which are the INPUTs to the mappers, not the OUTPUTs ! right ? This looks like a way to “encourage” us that we will use the same key types between the map input and output. This kinda makes sense, because sampling is done on the map input data, and partitioning is done on the map outputs. And the partitioner uses boundaries which are actually keys found during sampling, so they should be of the same type and same distribution. To illustrate the logic of question 3 : take the example job we just ran. The partition file contains the boundaries “FL” and “NY”. Imagine we use a custom mapper which replaces (state,city) by (state.hashcode,city). So for example (‘IL’, ‘Chicago’) becomes (20918, ‘Chicago’), which is no longer of type <Text,Text>, but <IntWritable,Text>. How would you classify 20918 compared to “FL” and “NY” for partitioning ? That would make no sense and would surely break a type or cast error. With a less dramatic scenario, imagine your mapper doesn’t transform the input pairs, but discards all pairs where the state is smaller than “J”. There would be no error, but you would loose half of your records, and your first reducer would have absolutely no output, because it is supposed to sort states before “FL”. The InputSampler expects us to keep the same keys between the input and the output of the map function. This way the sampled data is guaranteed to reflect the map output data, by having the same data type and distribution. The previous assumption is very reasonable. But sometimes we can’t use the same input data for sampling and partitioning. The “donations” dataset we created in part I and used in part II is a Sequence File with types <Text, DonationWritable>. The keys are the unique IDs of each record. Let’s say we want to perform Total Order Sorting, to sort all records by state. Use the file from the previous section, which contained all <state,city> pairs for sampling. In the mapper, transform the input (id,donation) to (state,donation) so that the output can be partitioned correctly using the partition file. I coded the solution to this problem in a class called TotalSortByState which you can view here on GitHub. To make things clear, we create 2 jobs in the driver code : one for the sampling, and one for the actual MapReduce job. The samplingJob (verbose name “Sampling”) is dedicated to sampling its own input file. We call FileInputFormat.setInputPaths() and pass it the sampling file’s path. It uses a KeyValueTextInputFormat because its input file is a text file consisting of (state,city) pairs. We set its Map output key class to Text, because we have to, as explained in the previous section. The funny thing is, this job doesn’t even have a map phase. So this has become a simple formality. The mrJob (verbose name “Total Sorting MR Job”) is the real MapReduce job. It will sort data and use the TotalOrderParitioner, whose partition file was generated during the first job. We have to call FileInputFormat.setInputPaths() again and pass it the dataset’s file path. This time we use the SequenceFileInputFormat because the input file is a Sequence File. Two values must obviously be shared between both jobs for this to work : the number of reducers, and the partition file destination. Otherwise the job will crash. We successfully used samples from the unordered “state-city” text file to partition our dataset on keys which were created in the map function. We first said that the InputSampler wants us to keep the same keys between the input and the output of the map function to stay coherent between sampling and partitioning. This is what we did by using the default identity mapper in the previous section. This time we used a different file just for the InputSampler. But we still maintained coherence between the sampling and partitioning phases, because in the MR job we transformed our map input into an output which was the same data as the sampling file. Now what if we want to do Total Order Sorting on our “donations” sequence file of <Text, DonationWritable> entries, using the same ordering as in the previous post ? A first solution would be to use the same technique as in the previous section. We could create a sequence file of <CompositeKey, NullWritable> pairs for each record of our <Text, DonationWritable> sequence file, and then use it as a separate file for sampling. But it would be boring to do the same thing again. Luckily, I’ve found a workaround to do this directly on the dataset file. We must maintain data type and coherence between the sampling and partitioning. The TotalOrderPartitioner uses the map output keys to calculate partitioning. Our map output keys are of type CompositeKey, because we are doing Secondary Sorting. For these premises we can deduce that … we have no choice but to sample CompositeKeys ! It looks like the only way this is going to work. But how ? Our InputSampler takes the “donors” sequence file as input, which is of type <Text, DonationWritable>, doesn’t it ? Well no, it doesn’t ! It takes the InputFormat as input. Muhahhaha ! We can do a small hack by modifying the InputFormat to extract and return CompositeKey keys on the fly instead of Text keys. In fact, our custom InputFormat will use a custom RecordReader, which will randomly read DonationWritable objects from the sequence file, and extract CompositeKey objects from them. Normally, the InputSampler reads the entire file and picks out random samples. But in our case this would be very costly, because we would have to read all 5 million DonationWritable objects (which contain over 20 fields) from the sequence file and create a new CompositeKey object each time. And most of these objects would be wasted, because the InputSampler would only pick a fraction of them. That is why I decided to push down the sampling task to a lower level, during the record reading. This way, only randomly chosen records are subject to CompositeKey extraction. So our custom RecordReader takes care of sampling before the InputSampler. But we still need to use an InputSampler to create the partitions file for the TotalOrderPartitioner. And if we used a RandomSampler, like in the previous section, it would pick random samples from our pre-sampled input data, which is a bit useless. So this time we will use a SplitSampler instead, to take all of the data coming from the InputFormat. Also, since our data, the “donations” dataset, is unordered and seems to have a random distribution on the “state” field, we will limit the number of entries that will be read for sampling. We can do this because we will implement our own RecordReader. Taking samples from 500k records will be about two times faster than from 1 million records, and the samples should have a very similar value distribution in both cases. The code is very similar to the job from the previous section, except that we now use the same input for sampling and map-reduce. The big difference with the previous job is not in the driver code, but in the custom InputFormat and RecordReader we implement. The custom InputFormat class used here is CompositeKeySamplingInputFormat (view). It extends the SequenceFileInputFormat with generic types <CompositeKey, NullWritable> so that the “hack” described above can work. nbSamples : number of samples to take. readLimit : number of records (starting from the beginning) to take samples from. The custom RecordReader class is : CompositeKeySamplingRecordReader (view). This is not a real implementation of a RecordReader. It is a fake record reader which encapsulates a real record reader, a SequenceFileRecordReader. It goes through all records from the sequence file reader, and does Reservoir Sampling to take a fixed number of samples nbSamples from the first readLimit records. It stores these samples as CompositeKey objects in an ArrayList and then serves them with the nextKeyValue() and getCurrentKey() method. Read more about Reservoir Sampling on wikipedia. The “total” donation amount field is supposed to be in there as well, but it’s probably not readable without decompression. By checking how the output file were delimited, we can see that they indeed have “IA Guthrie Center 100.00” and “NY merrick 125.00” as boundaries. This time the files are split on a specific (state,city,total) triplet, so “states” don’t need to be exclusive to a reducer. For example the “NY” state can be found in both outputs 00001 and 00002. This also gives better load balance, as the 3 output file have nearly the same file size. The job took on average 2min 31s, which is similar as the Secondary Sort from the previous part. How your partition file gets distributed across nodes, without using distributed cache?